Please RSVP by noon on Wednesday, November 14th if you plan to attend. Dinner is being catered (BBQ) so we need your RSVP in order to have enough food for all to enjoy. Please RSVP to Brenda Amos brendaa@wescoweld.com or by calling 251-378-4162. David Jordan with NexAir will be serving as our speaker at this month’s meeting. David will be giving a presentation on Micro-Gases. Our host, Nibrock, took its place in the clad welding industry using its chromium carbide overlay process of Rock Plate and Rock Pipe products that extends the wear life of materials. Owen Rickert at Nibrock will be facilitating a tour of the facility for those that want to see the clad tables working and in progress. A warm thank you goes out to Nibrock for allowing the Mobile Section of the AWS for sharing their expertise of wear resistant weld overlay. Let’s all show our support to a local business that produces the highest Quality Cladded Wear Plate and Pipe Products in the industry. A map to Nibrock is included within the Newsletter. This month is our second opportunity to witness new technologies in the welding industry and how they are applied. We are proud to announce that again due to our sponsors, Nibrock & NexAir, we are able to provide free meals to all the students. This meeting continues our efforts in recognizing our section students including free food, door prizes and serves as a reminder that we will also have our year end door prize drawings again this year. The more meetings a student attends the better chance he/she has of winning. 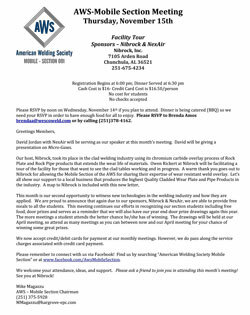 The drawings will be held at our April meeting, so attend as many meetings as you can between now and our April meeting for your chance of winning some great prizes. We now accept credit/debit cards for payment at our monthly meetings. However, we do pass along the service charges associated with credit card payment.